Our Autumn Winter ’15 Green Label collection digs deep into the world of the British scooter clubs. We look at the adoption of scooters from Italy into the British Mod subculture in the 1960s and the infamous scooter rallies across the country that have come to symbolize the MOD movement. In the 1960s the two big scooter manufacturers Vespa and Lambretta encouraged scooter owners to join clubs and attend rallies. Whether it was the thrill of the invasion or safety in numbers, the chaos of the scooter rallies proved addictive and exciting for young Mod’s. 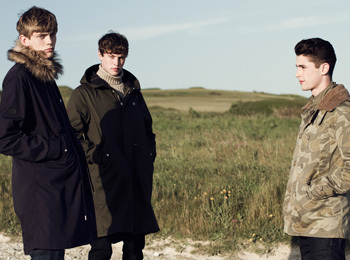 This season our Green Label collection features a range of casual jackets from the classic parkas to modern lightweight bombers and signature Pretty Green designs. Our best selling Cambert jacket has been reworked and seam sealed making it 100% waterproof and available in fresh new colourways. Another key piece is our Northway Jacket, a redeveloped version of our popular Bubbla design, built from a new lighter fabric for better ease of movement whilst retaining warmth and insulation from the goose down filler. Our shirting this season includes paisley, floral, checked and polka dot designs crafted from crisp cotton. Classic polo shirts in soft cotton pique also feature heavily in a variety of new colours alongside our statement graphic tees hand drawn in-house. This season Paisley and Camo are key stories running throughout the collection. We’ve designed our own Camo print, taking inspiration from a Swedish Camo pattern and hand drawing our own unique version. Paisley is a central story with a new tonal design featuring across polo shirts, footwear and bomber jackets amongst others.